"VLF" redirects here. For the car company, see VLF Automotive. Very low frequency or VLF is the ITU designation for radio frequencies (RF) in the range of 3 to 30 kilohertz (kHz), corresponding to wavelengths from 100 to 10 kilometers, respectively. The band is also known as the myriameter band or myriameter wave as the wavelengths range from one to ten myriameters (an obsolete metric unit equal to 10 kilometers). Due to its limited bandwidth, audio (voice) transmission is highly impractical in this band, and therefore only low data rate coded signals are used. The VLF band is used for a few radio navigation services, government time radio stations (broadcasting time signals to set radio clocks) and for secure military communication. Since VLF waves can penetrate at least 40 meters (120 ft) into saltwater, they are used for military communication with submarines. Because of their large wavelengths, VLF radio waves can diffract around large obstacles and so are not blocked by mountain ranges or the horizon, and can propagate as ground waves following the curvature of the Earth. The main mode of long distance propagation is an Earth-ionosphere waveguide mechanism. The Earth is surrounded by a conductive layer of electrons and ions in the upper atmosphere at the bottom of the ionosphere called the D layer at 60 to 90 km (37 to 56 miles) altitude, which reflects VLF radio waves. The conductive ionosphere and the conductive Earth form a horizontal "duct" a few VLF wavelengths high, which acts as a waveguide confining the waves so they don't escape into space. The waves travel in a zigzag path around the Earth, reflected alternately by the Earth and the ionosphere, in TM (transverse magnetic) mode. VLF waves have very low path attenuation, 2-3 dB per 1000 km, with little of the "fading" experienced at higher frequencies, This is because VLF waves are reflected from the bottom of the ionosphere, while higher frequency shortwave signals are returned to Earth from higher layers in the ionosphere, the F1 and F2 layers, by a refraction process, and spend most of their journey in the ionosphere, so they are much more affected by ionization gradients and turbulence. Therefore, VLF transmissions are very stable and reliable, and are used for long distance communication. Propagation distances of 5000 to 20000 km have been realized. However, atmospheric noise (sferics) is high in the band, including such phenomena as "whistlers", caused by lightning. VLF waves can penetrate seawater to a depth of at least 10 to 40 meters (30 to 130 feet), depending on the frequency employed and the salinity of the water, so they are used to communicate with submarines. VLF waves at certain frequencies have been found to cause electron precipitation. VLF waves used to communicate with submarines have created an artificial bubble around the Earth that can protect it from solar flares and coronal mass ejections; this occurred through interaction with high-energy radiation particles. "Trideco" antenna tower array at the US Navy's Naval Radio Station Cutler in Cutler, Maine, USA. The central mast is the radiating element, while the star-shaped horizontal wire array is the capacitive top load. About 1.2 miles in diameter, it communicates with submerged submarines at 24 kHz at a power of 1.8 megawatts, the most powerful radio station in the world. Another type of large VLF antenna: the "valley-span" antenna, consisting of multiple horizontal topload cables spanning a valley, fed in the center by vertical radiators. This example is at the US Navy Jim Creek station near Seattle, which transmits on 24.8 kHz at a power of 1.2 MW. A major practical drawback to this band is that because of the length of the waves, full size resonant antennas (half wave dipole or quarter wave monopole antennas) cannot be built because of their physical height. Vertical antennas must be used because VLF waves propagate in vertical polarization, but a quarter-wave vertical antenna at 30 kHz would be 2.5 kilometres (8,200 feet) high. So practical transmitting antennas are electrically short, a small fraction of a wavelength long. Due to their low radiation resistance (often less than one ohm) they are inefficient, radiating only 10% to 50% of the transmitter power at most, with the rest of the power dissipated in the antenna/ground system resistances. Very high power transmitters (~1 megawatt) are required for long distance communication, so the efficiency of the antenna is an important factor. High power transmitting antennas for VLF frequencies are very large wire antennas, up to a mile across. They consist of a series of steel radio masts, linked at the top with a network of cables, often shaped like an umbrella or clotheslines. Either the towers themselves or vertical wires serve as monopole radiators, and the horizontal cables form a capacitive top-load to increase the efficiency of the antenna. High power stations use variations on the umbrella antenna such as the "delta" and "trideco" antennas, or multiwire flattop (triatic) antennas. For low power transmitters, inverted-L and T antennas are used. A large loading coil is required at the antenna feed point to cancel the capacitive reactance of the antenna to make it resonant. To minimize power dissipated in the ground, these antennas require extremely low resistance ground systems. 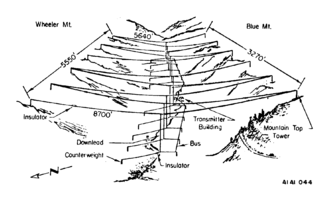 Because of soil resistance and dielectric losses in the ground, the buried cable ground systems used by higher frequency transmitters tend to have unacceptably high losses, and counterpoise systems are usually used, consisting of radial networks of copper cables supported several feet above the ground under the antenna, extending out radially from the mast or vertical element. The high capacitance and inductance and low resistance of the antenna-loading coil combination makes it act electrically like a high Q tuned circuit. VLF antennas have very narrow bandwidth and to change the transmitting frequency requires a variable inductor (variometer) to tune the antenna. The large VLF antennas used for high power transmitters usually have bandwidths of only a few tens of hertz, and when transmitting frequency shift keying (FSK), the usual mode, the resonant frequency of the antenna must sometimes be dynamically shifted with the modulation, between the two FSK frequencies. The high Q of the antenna results in very high voltages at the ends of the horizontal topload wires where the nodes of the standing wave pattern occur, and very good insulation is required. The practical limit to the power of large VLF transmitters is usually determined by onset of air breakdown and arcing from the antenna. The requirements for receiving antennas are less stringent, because of the high level of natural atmospheric noise in the band. Atmospheric radio noise is far above the receiver noise introduced by the receiver circuit and determines the receiver signal to noise ratio. So small inefficient receiving antennas can be used, and the low voltage signal from the antenna can simply be amplified by the receiver without introducing significant noise. Loop antennas are usually used for reception. The frequency range below 9 kHz is not allocated by the International Telecommunication Union and may be used in some nations license-free. VLF is used to communicate with submarines near the surface (for example using the transmitter DHO38), while ELF is used for deeply submerged vessels. VLF is also used for radio navigation beacons (alpha) and time signals (beta). In the USA, the time signal station WWVL began transmitting a 500 W signal on 20 kHz in August 1963. It used Frequency Shift Keying (FSK) to send data, shifting between 20 kHz and 26 kHz. The WWVL service was discontinued in July 1972. Historically, this band was used for transcontinental radio communication during the wireless telegraphy era between about 1900 and 1925. Nations built networks of high power LF and VLF radio stations that transmitted text information by Morse code, to communicate with their colonies and naval fleets. Early attempts were made to use radiotelephone using amplitude modulation and single-sideband modulation within the band starting from 20 kHz, but the result was unsatisfactory because the available bandwidth was insufficient to contain the sidebands. The Grimeton VLF transmitter at Grimeton near Varberg in Sweden, one of the few remaining transmitters from that era that has been preserved as a historical monument, can be visited by the public at certain times, such as on Alexanderson Day. Naturally occurring signals in the VLF band are used for long range lightning location and for research into phenomena such as transient luminous events. Measurements of whistlers are employed to infer the physical properties of the magnetosphere. Geophysicists use VLF-electromagnetic receivers to measure conductivity in the near surface of the Earth. High power land-based and aircraft transmitters in countries that operate submarines send signals that can be received thousands of miles away. Transmitter sites typically cover great areas (many acres or square kilometers), with transmitted power anywhere from 20 kW to 2 MW. Submarines receive signals from land based and aircraft transmitters using some form of towed antenna that floats just under the surface of the water – for example a BCAA (Buoyant Cable Array Antenna). Modern receivers use sophisticated digital signal processing techniques to remove the effects of atmospheric noise (largely caused by lightning strikes around the world) and adjacent channel signals, extending the useful reception range. Strategic nuclear bombers of the United States Air Force receive VLF signals as part of hardened nuclear resilient operations. OOK / CWK: On-Off Keying / Continuous Wave Keying. Simple Morse code transmission mode where the carrier is turned on and off, with carrier on representing the Morse code "dots" and "dashes" and carrier off representing spaces. This is the simplest possible form of radio transmission, but it is difficult for transmitters to transmit high power levels, and the signal can easily be swamped by atmospheric noise, so this is used really only for emergencies or basic testing. FSK: Frequency-shift keying. The oldest and simplest form of digital radio data modulation, with the carrier shifted between two frequencies, one representing the binary digit "1" and the other representing binary "0". For example, the frequency may be increased by 25 Hz from the carrier frequency to indicate a "1" and reduced by 25 Hz to indicate "0". FSK is used at rates of 50 bit/s and 75 bit/s. MSK: Minimum-shift keying. A more sophisticated modulation method that uses less bandwidth for a given data rate than FSK. This is the normal mode for submarine communications today, and can be used at data rates up to 300 bit/s- or about 35 8-bit ASCII characters per second (or the equivalence of a sentence every two seconds) – a total of 450 words per minute. Two alternative character sets may be used: 5-bit ITA2 or 8-bit ASCII. Because these are military transmissions they are almost always encrypted for security reasons. Although it is relatively easy to receive the transmissions and convert them into a string of characters, enemies cannot decode the encrypted messages; military communications usually use unbreakable one-time pad ciphers since the amount of text is so small. Radio amateurs in some countries have been granted permission (or have assumed permission) to operate at frequencies below 8.3 kHz. Radiated power from amateur stations is very small, ranging from 1 μW to 100 μW for fixed base station antennas, and up to 10 mW from kite or balloon antennas. Despite the low power, stable propagation with low attenuation in the earth-ionosphere cavity enable very narrow bandwidths to be used to reach distances up to several thousand km. The modes used are QRSS, MFSK, and coherent BPSK. Operations tend to congregate around the frequencies 8.27 kHz, 6.47 kHz, 5.17 kHz and 2.97 kHz. Bandwidths of a few tens of uHz are typical and both receiver and transmitter must have their frequency locked to a stable reference such as a GPS disciplined oscillator or a rubidium standard. The transmitter generally consists of an audio amplifier of a few hundred watts, an impedance matching transformer, a loading coil and a large wire antenna. Receivers employ an electric field probe or magnetic loop antenna, a sensitive audio preamplifier, isolating transformers, and a PC sound card to digitise the signal. Extensive digital signal processing is required to retrieve the weak signals from beneath interference from power line harmonics and VLF radio atmospherics. Useful received signal strengths are as low as 6992300000000000000♠3×10−8 volts/meter (electric field) and 6984100000000000000♠1×10−16 tesla (magnetic field), with signaling rates typically between 1 and 100 bits per hour. Spectrogram of an 18.1 kHz VLF signal, picked up using a small loop antenna and a sound card. The vertical stripes are distant lightnings. VLF signals are often monitored by radio amateurs using simple homemade VLF radio receivers based on personal computers (PCs). An aerial in the form of a coil of insulated wire is connected to the input of the soundcard of the PC (via a jack plug) and placed a few meters away from it. Fast Fourier transform (FFT) software in combination with a sound card allows reception of all frequencies below the Nyquist frequency simultaneously in the form of spectrogrammes. Because CRT monitors are strong sources of noise in the VLF range, it is recommended to record the spectrograms with any PC CRT monitors turned off. These spectrograms show many signals, which may include VLF transmitters and the horizontal electron beam deflection of TV sets. The strength of the signal received can vary with a sudden ionospheric disturbance. These cause the ionization level to increase in the ionosphere producing a rapid change to the amplitude and phase of the received VLF signal. GQD 19.6 kHz Anthorn (Britain) Many operation modes. NWC 19.8 kHz Exmouth, Western Australia (AUS) Used for submarine communication, 1 Megawatt. ^ a b c d Hunsucker, R. D.; John Keith Hargreaves (2002). The high-latitude ionosphere and its effects on radio propagation. Cambridge University Press. p. 419. ISBN 978-0-521-33083-1. ^ a b c Ghosh, S. N. (2002). Electromagnetic theory and wave propagation. CRC Press. p. 89. ISBN 978-0-8493-2430-7. ^ Marina Koren (May 18, 2017). "Humans Accidentally Created a Protective Bubble Around Earth". The Atlantic. Retrieved May 20, 2017. ^ Seybold, John S. (2005). Introduction to RF Propagation. John Wiley and Sons. pp. 55–58. ISBN 978-0471743682. ^ "Geonics Limited - VLF Receivers". Retrieved 13 June 2014. ^ "Sub 9kHz spectrum in the Amateur Service". Retrieved 13 May 2017. ^ "Some recent milestones with amateur radio experiments at VLF". Retrieved 13 May 2017. ^ Renato Romero, IK1QFK (2008). Radio Nature. Radio Society of Great Britain. p. 77. ISBN 9781-9050-8637-5. ^ Mardina Abdullah; et al. (2013). "Development of UKM-SID teaching module for space science education (6th International Forum on Engineering Education 2012 (IFEE 2012))". Procedia - Social and Behavioral Sciences. 102: 80–85. doi:10.1016/j.sbspro.2013.10.716. ^ Naval base link to jet plunge - The Sydney Morning Herald 14 November 2008, retrieved on 14 November 2008. Romero, R. (2006). Radio Natura (in Italian). Albino, Italy: SANDIT S.r.l. Klawitter, G.; Oexner, M.; Herold, K. (2000). Langwelle und Längstwelle (in German). Meckenheim: Siebel Verlag GmbH. ISBN 978-3-89632-043-8. NASA live streaming ELF -> VLF Receiver NOTE: As of 05/03/2014, the "Listen live" links are down, but the site has some previously recorded examples to listen to. This page was last edited on 16 March 2019, at 06:33 (UTC).